Climate change touches every part of American lives. Why aren't educational TV shows addressing it more? Are children too young to talk to about climate change? Some environmental educators say yes. But children are hearing about it from the media, from parents and siblings, and from friends at school and elsewhere. And data suggest many are growing increasingly concerned. In their 2015 review of the literature on young people and climate change, Corner et al. report that climate change is a major cause of concern and in some cases is “associated with feelings of anxiety, stress and despair.” The American Psychological Association warns that children can be overwhelmed by its implications. As a parent of two young children, I find these kinds of conclusions disturbing. And as an educational consultant on television programs, I’m interested in how television can be a catalyst for helping children navigate this issue. After all, television remains a leading source of informal education. It’s also a promising vehicle for climate change communication as it can place the issue in an entertaining and informal context, while leveraging the power of visuals. Applying the broadcast industry’s best practices in combination with a growing understanding of how to communicate climate change with young people can help foster appropriate communications that help children understand what climate change is; encourage them to share their questions and concerns; and leave them feeling empowered and hopeful about the future. In 2017, I surveyed educational television programs available on leading U.S. networks and subscription on demand (SVOD) providers. Broadcast networks are required to air at least three hours of educational programming per week. Given this is a new area of study, I chose to focus on networks with a potential reach of more than 95 percent of the population. SVOD providers were included given their rapid expansion into the entertainment market. 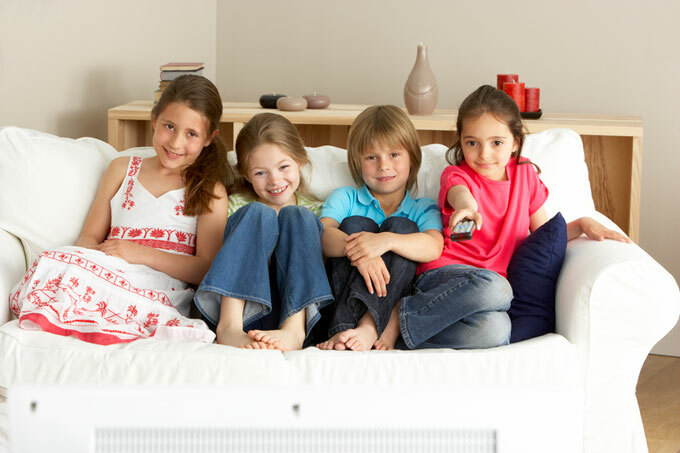 Recent surveys show 72 percent of children’s viewing is from streaming services. Twenty-five television programs met the selection criteria of being aimed at children ages 7-11. After identifying episodes with climate change content, I performed a qualitative analysis using a tool I adapted from Tania Ouariachi’s work to look at narrative elements and information and messages about climate change. Here are a few of the most important findings (see full study). Of 25 programs reviewed, only four had an episode with climate change content. Given the range of subjects covered, from wildlife to space science, there were many opportunities to include climate change in those programs. One of the most surprising things is that climate change is not showing up in programs about wildlife or nature – a leading area of programming for children. That is the case even though those programs frequently deal with topics that have links to climate change. Climate change content was not found in programs offered by major commercial broadcast networks (NBC, CBS, ABC, FOX, The CW). One explanation for the limited coverage of climate change may be that program providers think the issue is complex, and/or too controversial politically. A spokesperson for PBS Kids, for instance, is quoted as saying that focusing on “foundational science concepts” is the most age-appropriate way to serve younger audiences. Others suggest the topic is viewed as being too controversial. A writer from Netflix’s The Magic School Bus Rides Again reports that when authors submitted a climate change script, many expressed concerns it might be rejected because it is viewed as being too controversial, or too politically charged. Both examples suggest a need for better insight into why educational television often fails to cover this important topic. Each of the four episodes analyzed uses some of the recommended approaches for communicating climate change with younger audiences, such as having an overall positive tone, using age-appropriate and accessible language, and featuring peer characters engaged in positive actions. That these are also established best practices in educational television suggests that it is well positioned to deliver climate change content to younger audiences. However, important areas where producers are missing the mark involve personal relevance, climate imagery and the use of alarmist tones. Personal relevance: Program creators are not making climate change relevant to children’s lives. Overall, the topics most often used to introduce climate change aren’t those that children care most deeply about. For instance, narratives centered on distant glaciers support the view that climate change is something occurring somewhere remote and is not easily relevant to “my life.” More effective approaches might focus on local wildlife or environments that children enjoy, such as beaches or parks or zoos. Using wildlife narratives also offers opportunities to introduce some of the more complex impacts of climate change, such as implications for ecosystems and populations, that young people might otherwise fail to grasp. Climate imagery: Each of the four episodes reviewed uses climate imagery, like smokestacks and glaciers, that is classically associated with climate change. However, research with older audiences shows that these types of images do little to broaden audience engagement on climate change. And while little is known about how younger children respond to climate imagery, high school students report that images of local climate impacts help to better communicate personal relevance, and that images depicting every-day actions help them feel empowered to make a difference. Alarmist tone: Scenes of doom? Alarmist language? One of the most troubling findings involves the presence of scenes with alarmist qualities. In writing about the use of narratives in science communication, Julie Downs, an associate professor at Carnegie Mellon University in Pittsburgh, Pa., cautions that although fear may be effective in capturing audience attention, focusing on threats impairs cognitive processing needed for taking in and making sense of information. Additionally, children’s emotional responses to this type of communication may result in psychological distance or feelings of disempowerment. This finding suggests a need for more awareness of counterproductive impacts on youth resulting from fear-inducing representations of climate change. 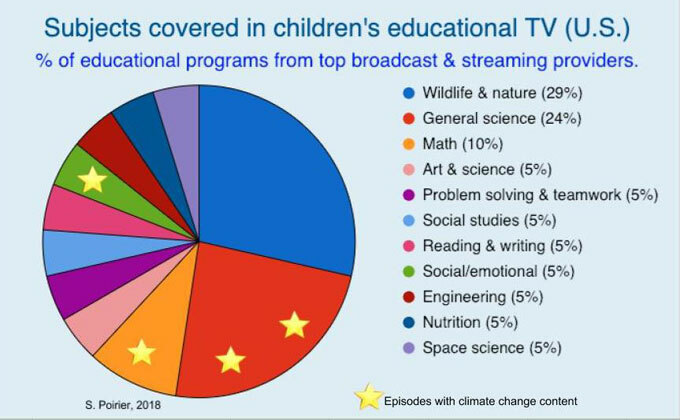 Educational television has powerful advantages in helping children understand climate change and promoting positive attitudes and engagement on the issue. But producers are not taking advantage of these TV opportunities and what is known about communicating the topic to children. Researchers and those involved in educational TV for youths must further explore reasons for the lack of coverage and address obstacles to increasing high-quality climate change content. There is also a need to address gaps in understanding how to effectively communicate climate change with children: Are there discrepancies between how younger children and older youth relate to climate change? Which frames or topics are more likely to resonate with which children? And how do youth respond to different types of climate imagery? The children of today will become voters and decision makers in coming years when the adverse impacts of climate change are even more fully realized. Appropriately tailored communication can help ensure they are adequately informed and hopeful about the future and their role as in-formed citizens. Communicating climate change with youth? Use a positive tone: The need for communication with children to have a positive tone is well-established in environmental education. A lack of positive messages about climate change in the media prevents many young people from engaging on the issue. Make it visual: Visuals can make climate change concepts more concrete and the impacts more tangible. Use accessible language: The complexity of climate change jargon and information can be a barrier to learning and engagement. Communication with children should reflect their knowledge and language level. Use trusted messengers: Youth identify scientists, teachers, parents, and peers as trusted messengers. Peers are highlighted as particularly promising. Make it relevant: Climate change communication should be framed in a way that speaks to the values, interests, and experiences of youth. Promote self-efficacy: When young people feel as though they are able to take positive actions that help address a problem, they are more likely to be engaged. Sara Poirier is founder of a strategic science communication and public engagement firm. A resident of Rhode Island, she has a MSc. in Science Communication & Public Engagement and a BSc. in Astrophysics.